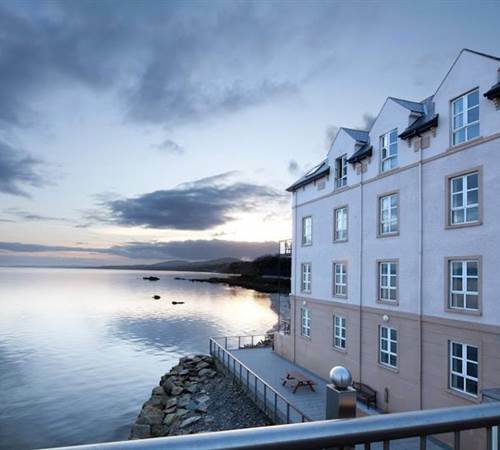 The Redcastle Hotel, Spa and Golf Resort is located in one of the most beautiful places in the world near the town of Moville on the Inishowen Peninsula. Relax and enjoy our parkland golf course and acres of unspoilt countryside and of course the incredible views across Lough Foyle which is constantly changing as the tides turn. Enchanting Donegal on your doorstep there is so much to see and do, or hop on the Car Ferry to Northern Ireland. Nearby, the city of Derry is only 25km or Donegal town less than 1.5 hours driving time. Traveling from Belfast is about 2 hours drive and Dublin 3.5 hours. The Lough Foyle Car Ferry connects nearby Greencastle with Magilligan on the opposite bank. There are frequent ferry sailings throughout the day depending on the season and weather conditions. The City of Derry Airport is just over 30 minutes drive with direct flights from London Stanstead, Liverpool, Birmingham, Glasgow and Manchester.